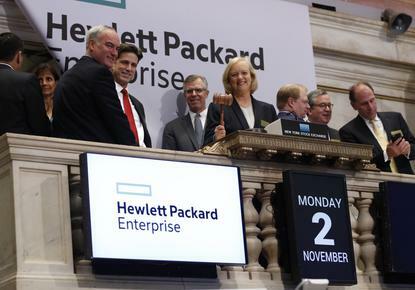 Hewlett Packard Enterprise is capitalising on the complexity and confusion of Dell’s multi-billion dollar acquisition of EMC, taking over 100 partner and customer deals away from its tech rival during the last quarter. In a wide-ranging interview with CNBC, CEO Meg Whitman claims the proposed $US67 billion merger - set to close between May and October this year - is directly impacting Hewlett Packard Enterprise’s business for the better, as both companies head down different strategic paths. “In the last quarter, we had about 107 deals that we actually took from Dell and EMC, whether they were partner deals or customers,” Whitman says. “We’re capitalising on the fact there's a lot of integration challenges and a lot of things going on at Dell and EMC. After officially separating from HP Inc on November 1, Whitman says Hewlett Packard Enterprise has become a “fast and nimble” company, claiming that Dell’s increasing debt load to be a barrier to innovation. “We chose to get smaller in the context of this rapidly evolving market, they chose to get bigger,” Whitman says. “We chose to delever the company, they will now have $US60-$US65 billion of debt on the company. We are investing in new technology, they're doubling down on old technology with a big cost take out play. “In many ways, you have to remember that a big shareholder of this new company is a private equity company. What do private equity companies do? They rip cost out. While Whitman isn’t the only tech CEO to take aim at Dell during recent months - nor will she be the last - this round of digs has so fair failed to trigger a response from Dell CEO Michael Dell, who has been quick to dispute such claims in the past. But for Whitman, the facts speak for themselves. “That’s what they are doing,” Whitman told CNBC, “they are doubling down on a lot of older storage products, server products, and then they are going to take cost out. Despite Whitman’s preference for organic growth, closer to home Hewlett Packard Enterprise is widely tipped to pursue mergers and acquisitions opportunities within the coming year - particularly in relation to the company’s cloud strategy. “We bought Aruba Networks,” Whitman adds. “It’s complementary technology that we can put through our distribution system. Referring to the company’s three-par all flash storage array. Whitman says the tech giant now has a “common storage architecture” from high-end storage, to mid-tier, to all flash, to low end. “What that means for the customer is lower total cost of ownership, lower service cost, simplicity of operating our storage product,” Whitman adds. “As opposed to some of our competitors who have different architectures because they have acquired those products overtime.